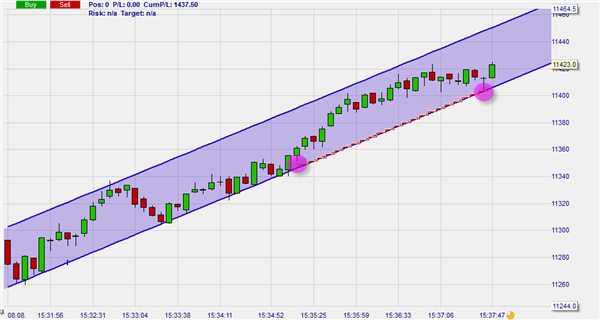 Draw your trendline or -channel and instruct NanoTrader to use it as a stop loss. Many traders use trendlines and trendchannels. NanoTrader allows the trader to actively use his trendline or -channel as the level for a stop order. You can use your trendline or -channel as a stop. Your stop order will automatically follow the slope of the trendline or -channel. You can use this function in any time frame and on any instrument. Your position remains open as long as the trend remains intact. The intelligent trendline or –channel stops allow the trader to surf the trend when managing open positions. This example shows a trader who bought a long position and who used the bottom of his trendchannel as his stop. The stop order automatically follows the trendchannel. This example shows a trader who combined a profit target (green line) with a stop loss on his trendline. The profit target was reached and the position closed with a profit. Besides stop orders based on the trend, the NanoTrader offers many other types of intelligent stop orders. Professional trader Birger Schäfermeier likes the NanoTrader trading platform. He offers several of his strategies and tools in the platform. Discover NanoTrader... download a free demo.